Ba Be lake – Ban Gioc Water Fall – Pac Bo cave 3 Days takes you from Hanoi to the natural wonderland of Northwest Vietnam with Ba Be Lake and Ban Gioc Waterfall. Ba Be Lake in Ba Be National Park is an incredibly beautiful area boasting waterfalls, rivers, deep valleys, lakes and caves set amid towering peaks. The area is inhabited by members of the Zao, H’mong and Tay minorities. 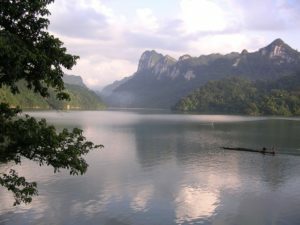 For the Vietnamese people the place has been full of magic and mystery for over 1,500 years and the mystical lake has been the source of legend and folklore ever since people first settled in this area. Ban Gioc Waterfall on the Quy Xuan River is located in Cao Bang Province, nears the Sino-Vietnamese border. The waterfall falls thirty meters. It is separated into three falls by rocks and trees, and the thundering effect of the water hitting the cliffs can be heard kilometers away from Trung Khanh. Whether continuing with other Vietnam package tours or returning to your home, this Vietnam discovery tour is sure to leave you lasting impression and create unforgettable moments. 07h00 : Departure from Hanoi to Ba Be National Park. 12h00 : Lunch in a local restaurant in Cho Ra Town. 14h30 : Arrival at Buoc Lom Wharf. Boat-trip along the Nang River to Ba Be Lake, one of 20 biggest fresh lakes on the mountain in the world. 16h00 : Visit to An Ma Temple to know more religions and beliefs in Vietnam. 17h00 : Swim in fresh water and enjoy the lake around. 19h00 : Dinner and traditional Tay musical performance (excluded). You can share the show with other tourists. 21h00 : Overnight at homestay of Tay people’ traditional house-on-stilt. 07h00 : Departure for Cao Bang. 15h00 : Visit to the Nguom Ngao Cave (Tiger cave). 07h00 : Check-out and start to visit Pac Bo Cave *, where President Ho Chi Minh came back to Vietnam after 30 years abroad. Visit to Pac Bo Cave, Lenin river, Karl Marx mountain, stone table..
12h00 : Have lunch in a local restaurant on the way to come back to Ha Noi. 19h00 : Arrival in Hanoi. The tour ends. The tour is type of driving one, most of your time is spent in the car for driving from A to B but we will do our best to give you good paces so that you won’t feel tiring of doing the tour activities. Average driving speed on the mountian roads is 35km per hour. Accommodation is expected to be basic but the top of the areas will be used for your best confort possible. Food is very local, too. There is no western food to expect except bread, fried eggs for breakfast at some places. Meals are at local food stores but we always choose the most acceptable one.